Vicente-Juan Ballester Olmos (Valencia, Spain, 1948) has been employed by Ford Motor Company for 30 years as a Manager in the Finance community, up to his early retirement in 2015. 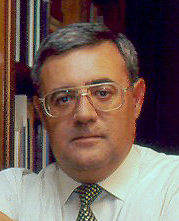 Mr. Ballester Olmos has been a UFO researcher since 1966 and is the author of nine books and 480 articles and papers: He played a key role in the process of declassification of the Spanish Air Force UFO files, he is the only civil ufologist interviewed by the journal of the Spanish Ministry of Defense and the only UFO researcher to post a review article in the MoD web site. He has delivered speeches in Spain, France, England, Germany, Italy and the United States. He is an active promoter of scientific-oriented ufology and he is proactively focused to team work. A correspondent and friend to the most noted figures in the field in the last 50 years, his blog FOTOCAT illustrates a major project that has created the largest database in the world devoted to photographs and footage of UFO phenomena, with 12,050 entries as of January 2017. Detailed Bio. As is a natural, expected process, my assessment of the UFO problem has evolved in the course of these 50 years of research. From an initial estimate sympathetic to the concept of an extra-terrestrial origin, my present view is that the probability of an alien nature of UFOs is practically zero. Misperception and bad case evaluation contributes to the residue of unexplained sightings, in addition to atmospheric optics phenomena and undisclosed military weapons. The phenomenon of UFOs behaves rather like a myth in progress, a false belief fuelled by media, publishing, movies and television. UFO phenomena is subject to scientific study and many disciplines can be successfully applied to the investigation of this extremely important social and cultural phenomenon. Serious researchers can do a valuable work in compiling, organizing and analyzing the best available evidence to confirm or refute my present assessment.